With the afternoon away from the office I took a trip into town with the twins. They opened their first bank account, receiving a story book and money box each for doing so. After climbing the hill from Stockbridge, and before visiting the bank we stopped at Waterstones on George Street for some refreshment. There is a Costa to the back of the shop. We all had milk, mine with added shots of espresso. 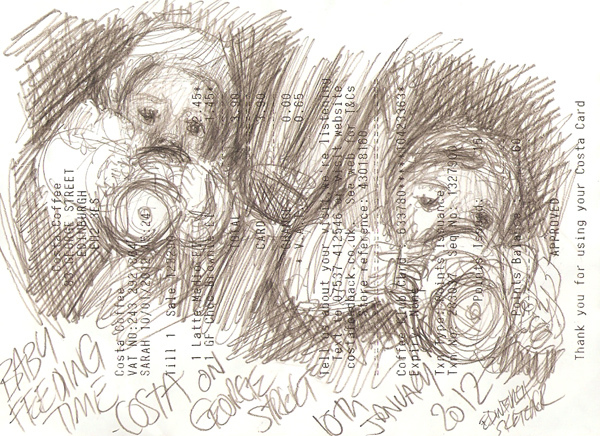 This is a pencil sketch of the twins drinking their milk in the pram. I like the scribble effect, it looks almost ghostly. Very different from yesterdays Where Art I? sketch.